The Airbus wins, FYI 😉 This was my first time flying via Air France and it was wonderful – complimentary champagne with the meal in addition to wine. This was not the case on my flights to Las Vegas last month, where a couple of ladies actually returned their wine after realizing they had to pay! Oh, here’s a lesson: I didn’t know I would have to go through international security again upon arrival in Paris for my layover, and was forced to down my entire water bottle! Drink all your water while you can. Once through customs I boarded my next flight and started practicing some of the Turkish notes that Feyza prepared for me, along with reading my trusted Lonely Planet (“Learn some Turkish”, was one of my tips in my previous planning post). I peered out the window during the final phase of descent and notice that we’re flying close enough to the water to see beautiful blue-green hues. Then I experienced a spectacular airplane landing! The kind where you cruise over the water not knowing where the land and runway even begin! 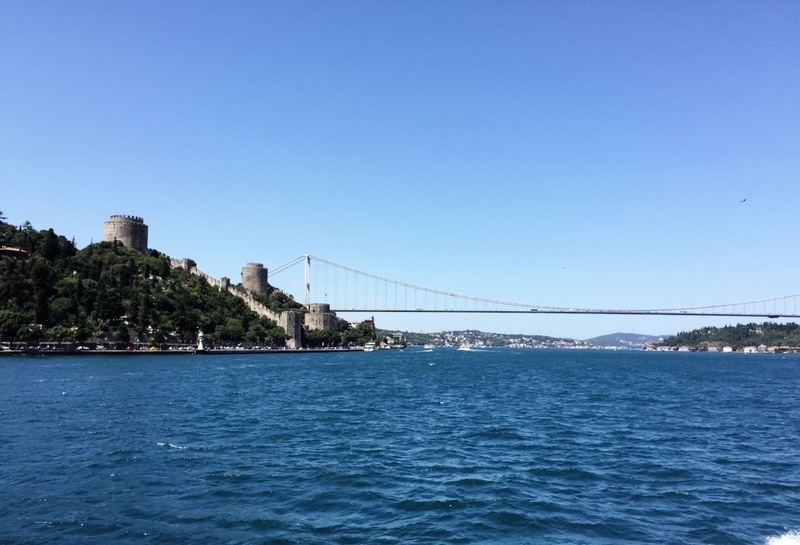 I don’t have a photo, so here’s a photo from my Bosphorus Cruise instead (more details on this further down). 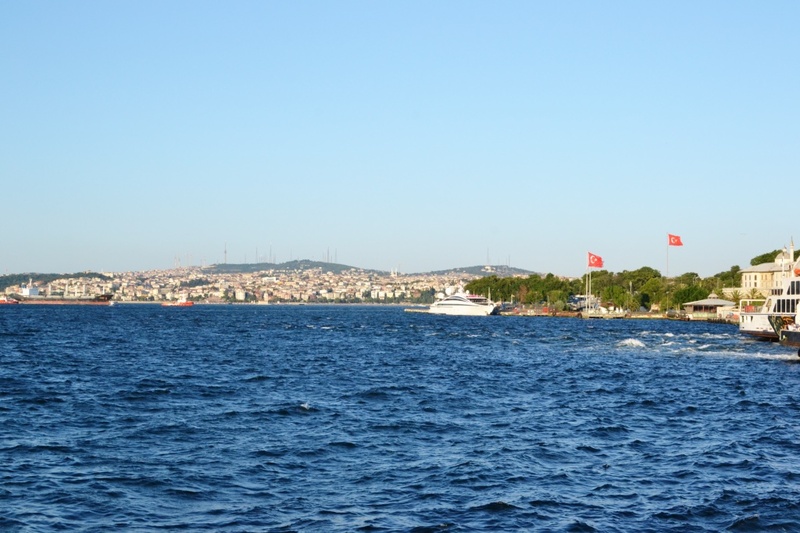 Istanbul Airport – Immediately, I felt that I was in a foreign place! 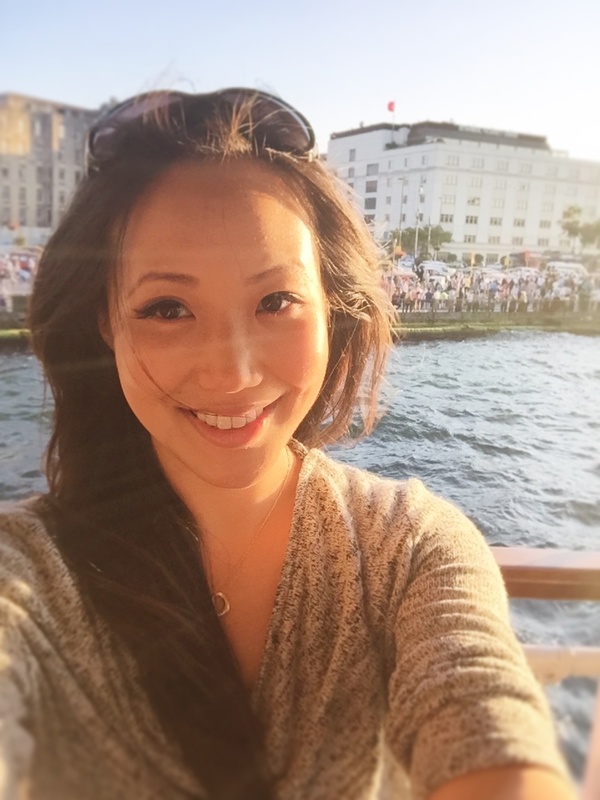 Growing up in a city as diverse and multi-cultural as Vancouver, I’m exposed to many cultures. 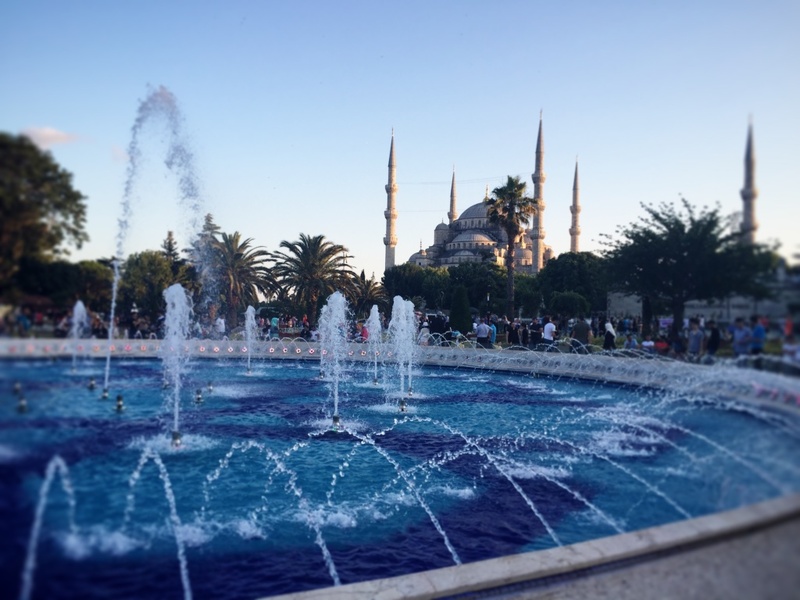 Arriving at the airport in Istanbul was the beginning of sensory overload – the language was unfamiliar and people dressed differently. From a logistics stand point, I messaged Alison (she was arriving the next day) telling her to bypass the first line that’s for locals and continue to the next. After customs, I followed the masses and it was easy enough picking up my luggage, except, it was missing a wheel! I learned somewhere that the best time to file a complaint, be it hotel service or damage luggage, is NOW, so I dragged all my bags over to the far end of the airport, only to be told to return to the other side to file my report! They gave me a sheet and told me to call Air France when I returned home. 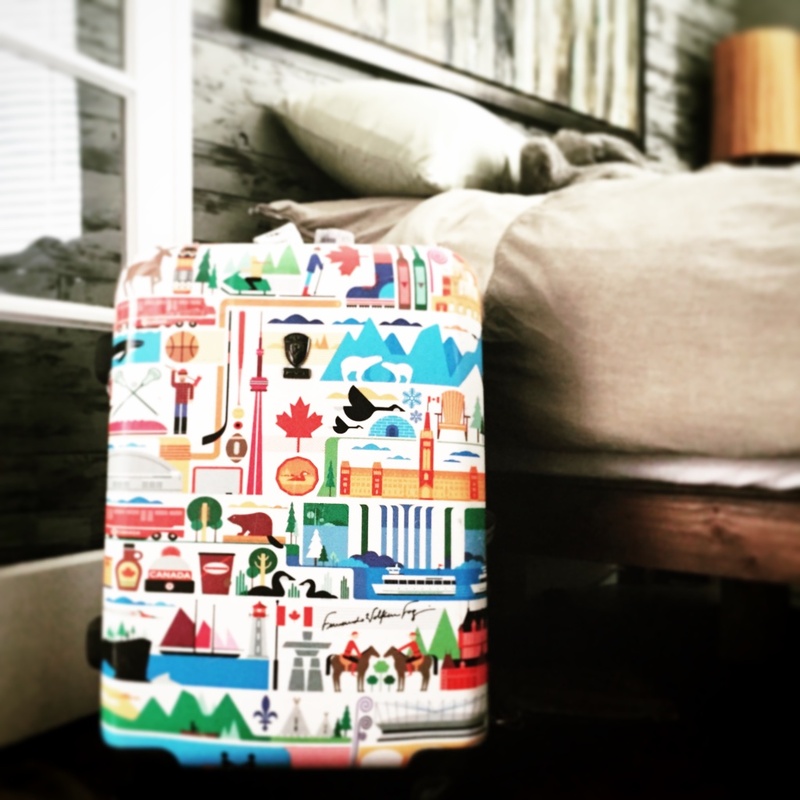 I had just purchased this charming, very Canadian luggage a month earlier so rolling it around with a missing wheel was such a pain. After exiting the terminal with my luggage (by the way, having this separation between the luggage and the public is how it should always be done! I question the safety of having luggage in open areas where the general public can access), I’m greeted by a sea of signs with all different names on them. Thankfully, mine was easy to find. The greeter swept up my luggage and made a quick phone call. Moments later, a driver pulled up in a spacious air-conditioned van. Finally, I could sit back, stretch out my legs and marvel as this completely new scene unfolded before me! My driver didn’t speak English. This would be my first lesson in gratitude to Feyza for having taught me Turkish! We drove past beaches and then made a sharp turn and began our windy ascent up cobble streets. 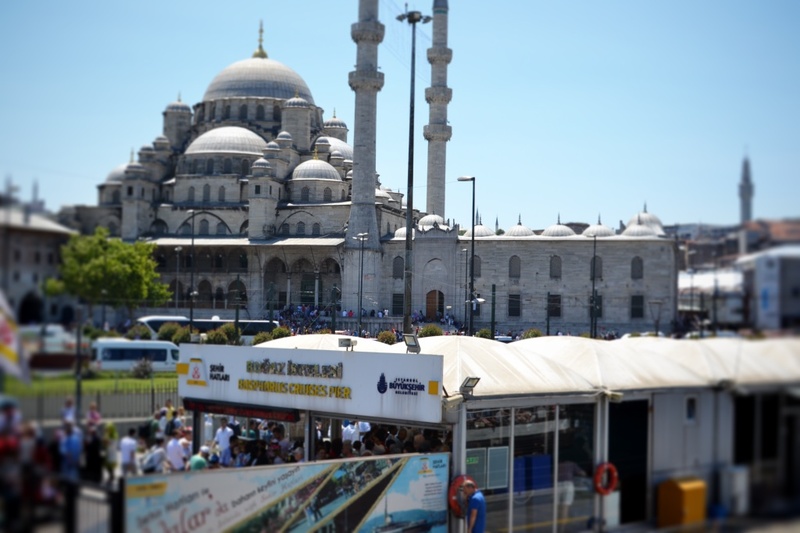 I could see the two famous Istanbul structures in the distance, and we drove past the Blue Mosque and Hagia Sophia (more on that in the next post – Full Day Istanbul Tour) and a moment later we stopped smack in the middle of the street! We had arrived at the hotel. 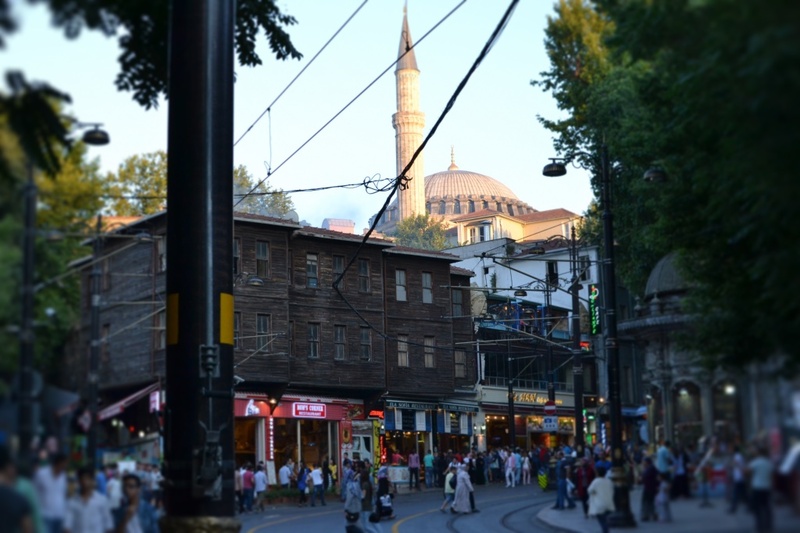 Hotel Empress Theodora – Fantastic location, bordered on all sides by the famous Sultanahmet attractions of the Blue Mosque, Hagia Sophia, Topkapi Palace and Basilica Cistern. Check in was smooth and I was relieved to offload my luggage and wash up. I texted Muharrem, my local travel agent, and then made my way over. 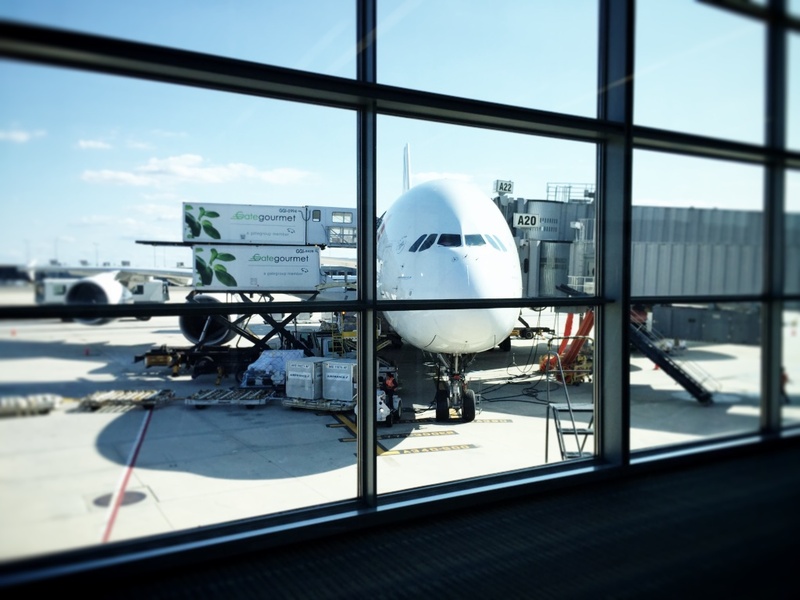 I’ve raved about their service in my overview post, and adding to that – it was so nice to have a “friend” upon arrival, especially as a female traveler in a foreign place on my own for the first time. He offered me apple tea, which Alison and I would end up drinking a LOT of during our Turkey travels, and then I got to chat with him and his colleague Osman about ideas on what to do. 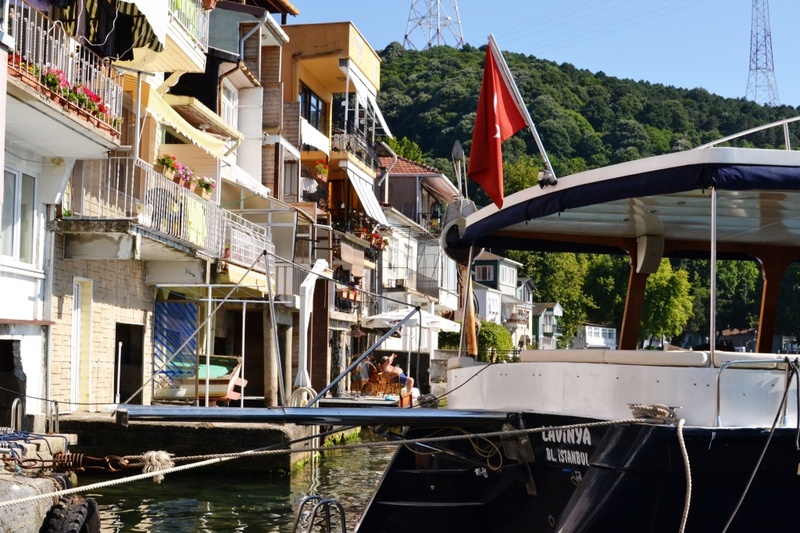 They suggested a boat cruise along the Bosphorus – “You won’t need a tour guide for that, just go to the water and pick up a ticket”! I arrived at the end of Ramadan, the month long fast, and now was a period of celebration: families would have time off to celebrate and OH, did they celebrate! People were everywhere and stayed out into the late hours of the evening. 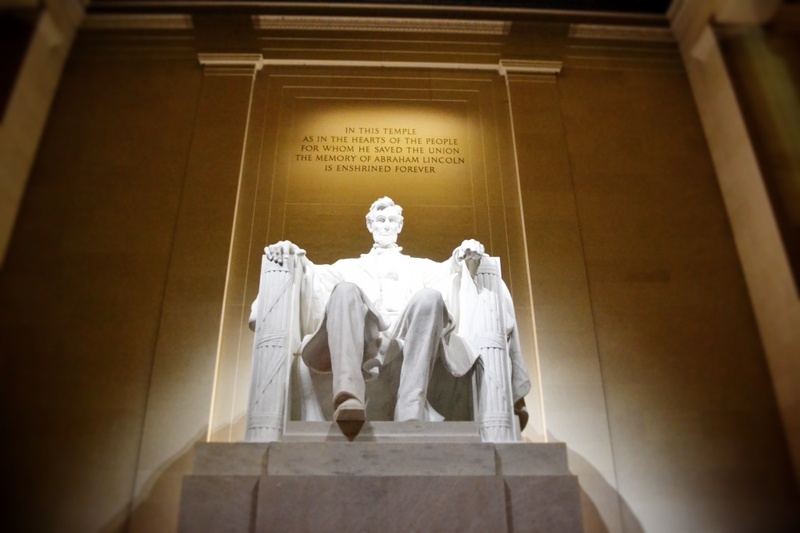 This was an unplanned surprise, although, I’ve traveled during large festival times before (see: Chinese New Years in China which is one of 100 trips to take in a lifetime according to this list!). 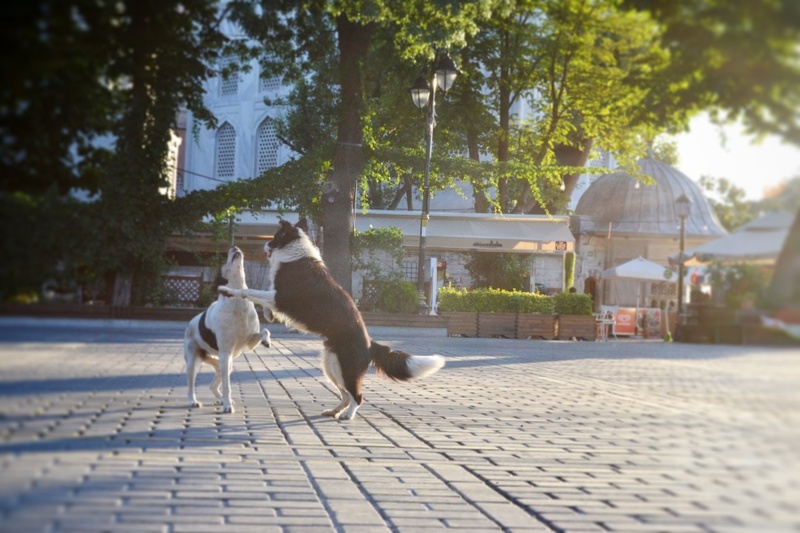 – The street dogs looked way different than the ones in Chile! Here they had thick, healthy coats of hair and tags on the ears – I later learned that the dogs were very well taken care of and monitored for health. 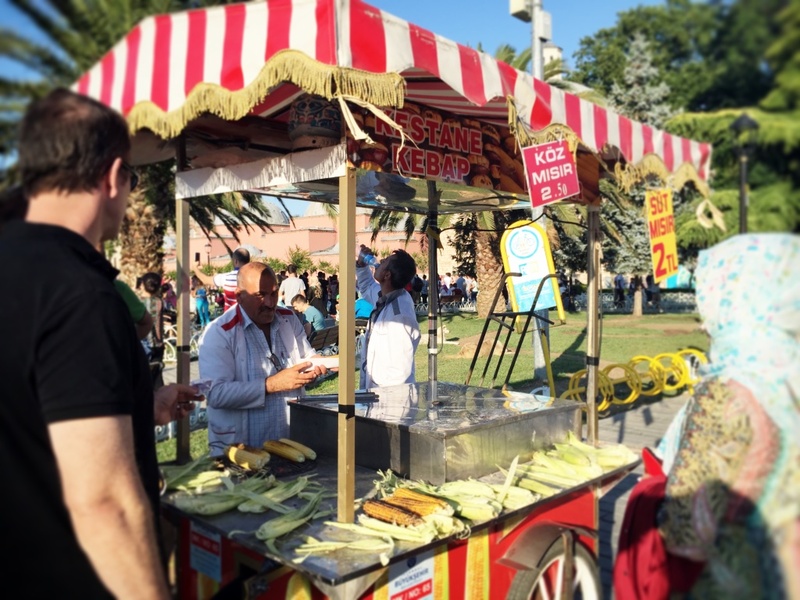 – Street food = corn! 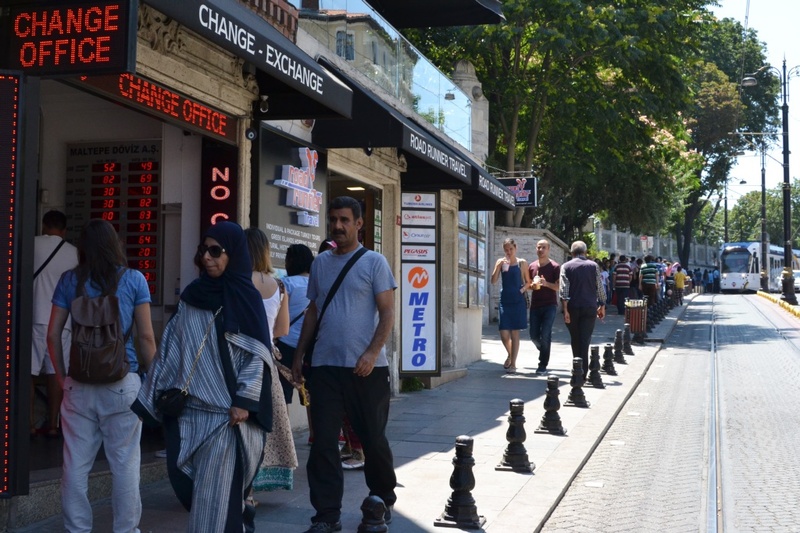 – Muharrem warned me about the “boys at the square” who would pressure me to buy things. He told me to ignore them and that I did. I was never scared for my safety, since there were so many families around, but I was definitely annoyed when I was followed for a couple blocks by people. At least it was daylight! 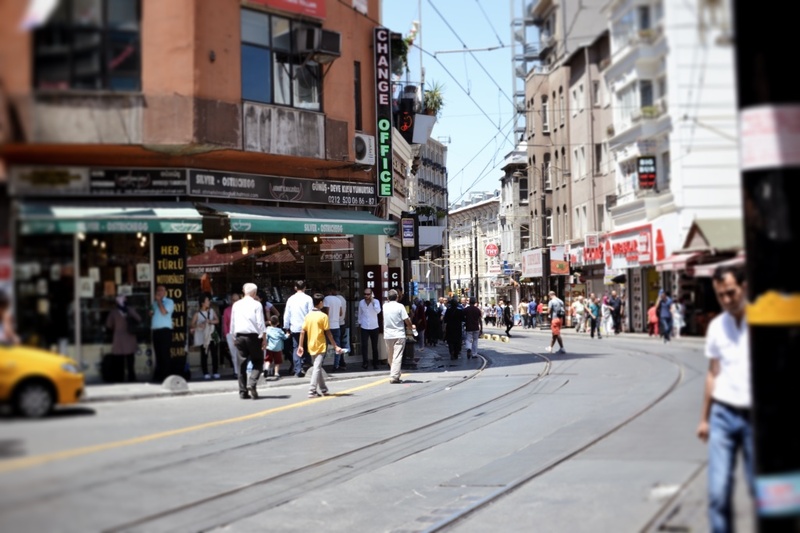 I returned back to the Travel Agency where I met Muharrem and we went for a walk around the neighbourhood. I had asked him earlier to show me a spot for the BEST baklava in the city! 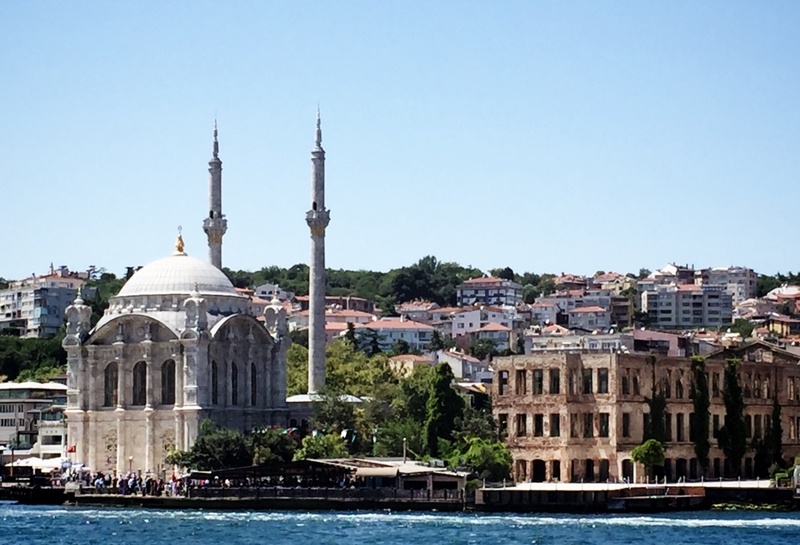 So, we walked down the road and in 10 minutes, we arrived at the water with gorgeous views of the Galata Bridge which spans the “Golden Horn”, The Galata Tower and other mosques with their unique minarets dotting the skyline. I am so grateful Muharrem accompanied me to the harbour and gave me this useful tip to get here from my hotel: just follow the tramway! 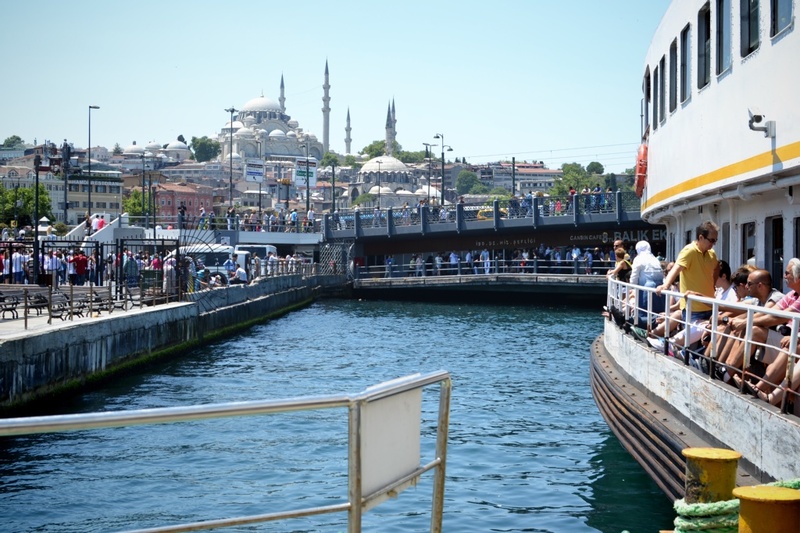 The commuter boats and ferries depart right around this spot and near the Galata bridge. 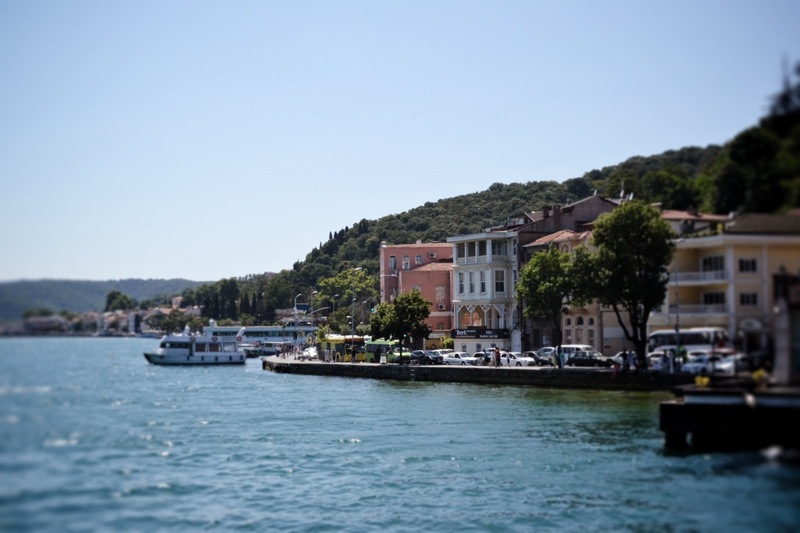 It was helpful to get acquainted with this area since I would be running around here the next day to buy ferry tickets. 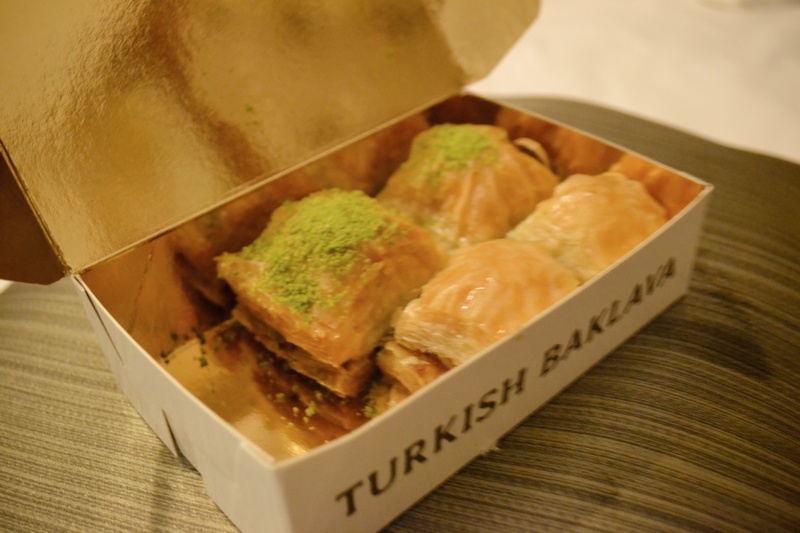 After watching the last bit of sun fade away, I capped off the evening by buying some baklava. It was incredible! Perfect amount of chewiness and layers upon layers of delicate, flaky pastry coated with sticky honey. I loved the variety of nuts used too. I almost ate the whole box, but saved the largest piece for Alison, so she that she would have something sweet when she arrived the next day. 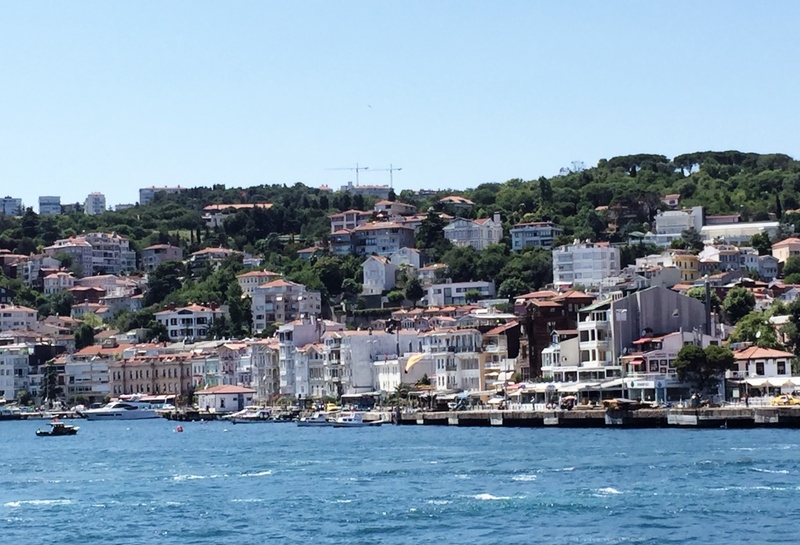 Day 2 – First Full Day in Istanbul! After getting out of bed, I excitedly skipped up the stone steps to check out breakfast. It was glorious! I scouted out the patio the day before, but it looks better when you have a full plate of delicious vegetables with you! 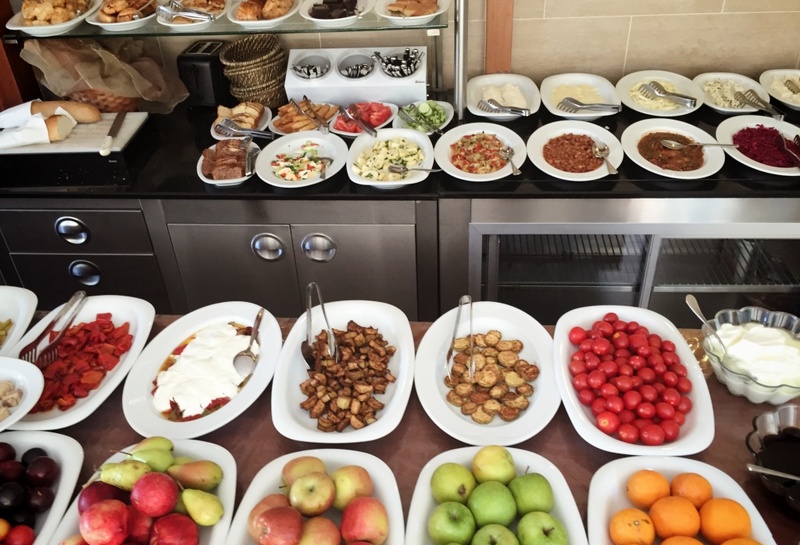 This is one of many reasons I was thrilled to come to Turkey – I had heard the food and breakfast was incredible (wow, they serve vegetables!!). This was HANDS DOWN the most elaborate breakfast I had on the trip. 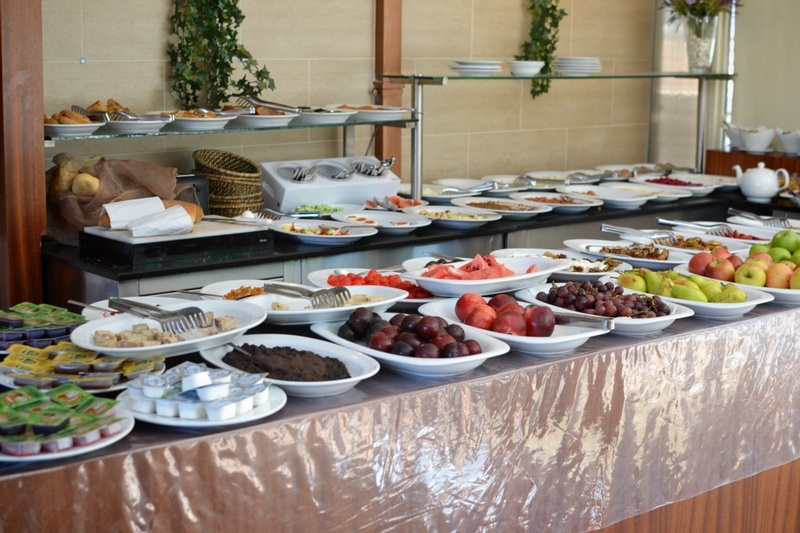 In my final night at the airport hotel, I quite enjoyed their elaborate and fancy spread, but this had just as much variety and a homemade wholesomeness to it. 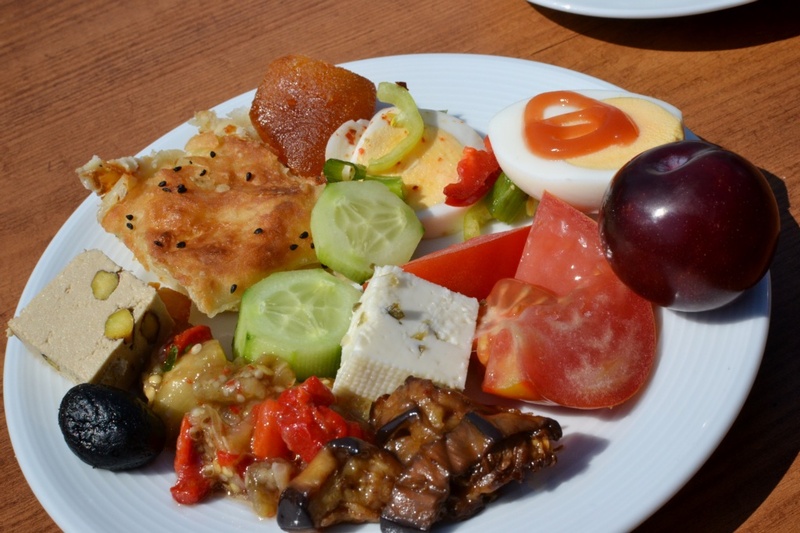 Prior to arriving in Turkey, I saved images of all the famous Turkish dishes I was on a mission to eat. To my absolute delight, some of those very things were here! 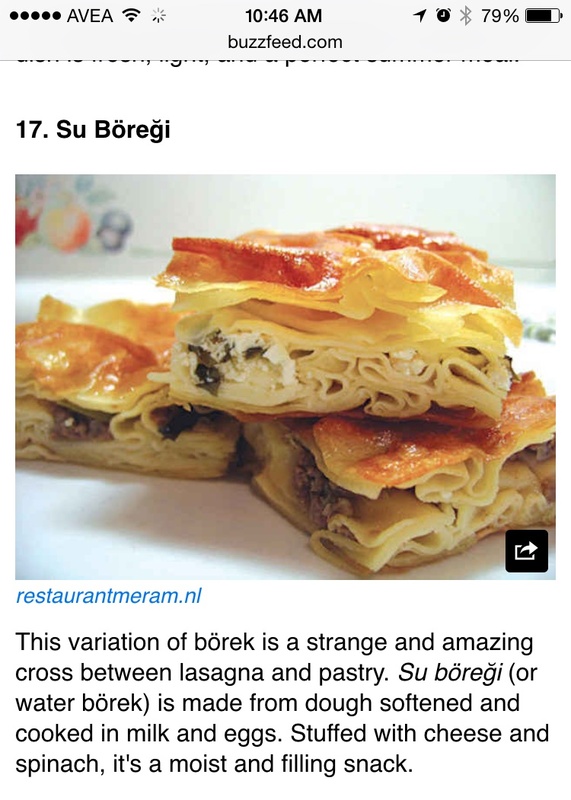 Like this “cheese lasagna” pastry! There were also many surprises. Like the various eggplant. And salsa. And more cheese pastries!! I looked up the boat times and saw that I could take a later departure at 1:30 pm and decided that I could take my time getting there. 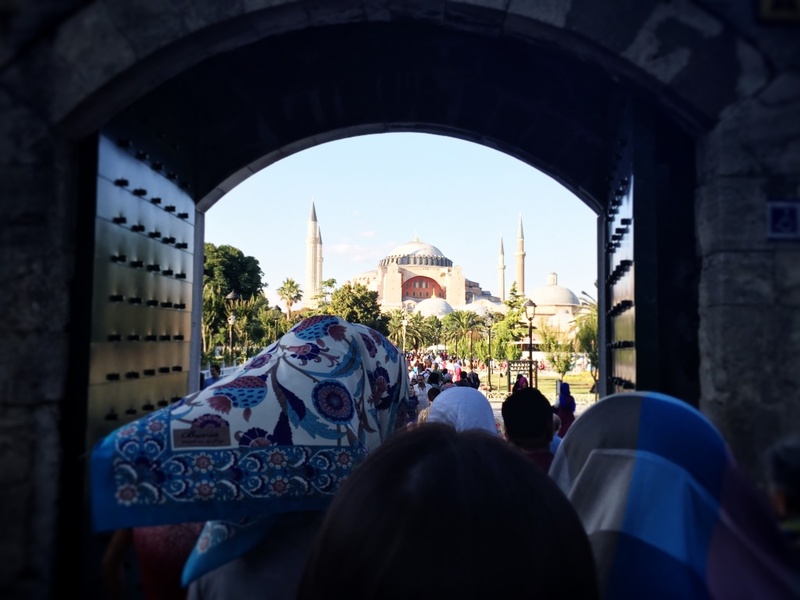 On becoming an Istanbul tour guide! 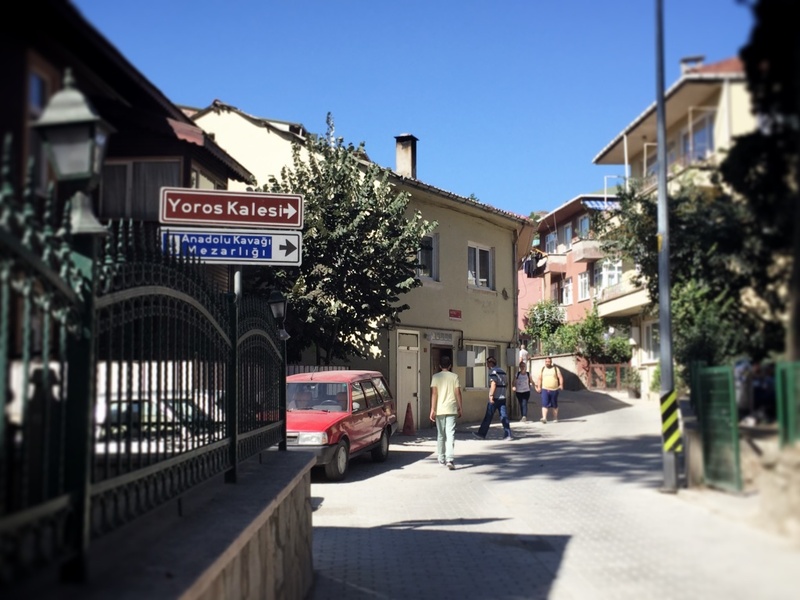 I said goodbye (güle güle) to the gentlemen at reception who was helping another hotel patron when I heard her ask, “Do you know where she’s from”? I turned around and respond, “I’m from Canada”! Woman: Where are you going? Me: I’m going to go on a boat cruise today! Woman: Can I follow you? Wow. I admired her bold and direct request! I thought to myself, why not! 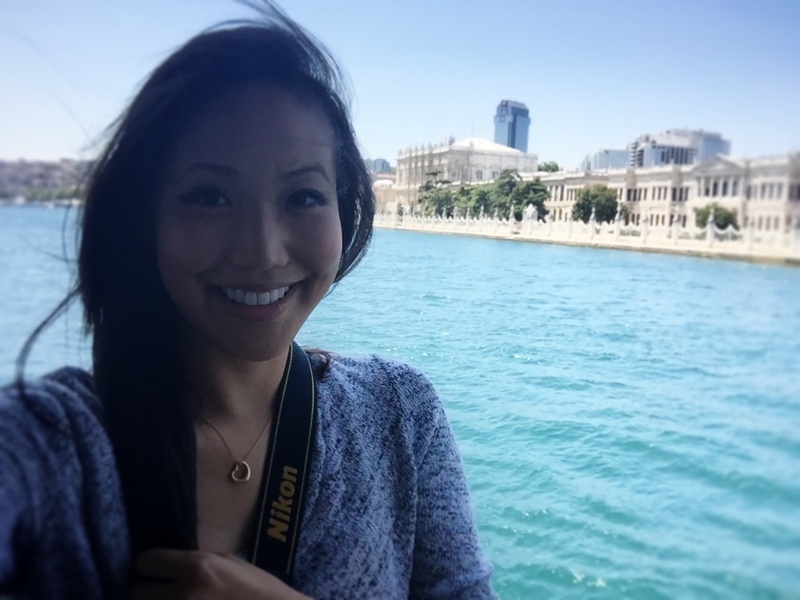 I’m here in Turkey on this adventure to learn new things and figure out how to get around and explore, so why not take someone along on the ride? She was upfront about being slower and I said, “no worries, I like to stop and take photos of little details anyways”! Since I had such a warm welcome from the Road Runner Team, I introduced her to them in case she wanted to arrange other tours. While there, she tried apple tea too. I looked at the time and saw we were now getting close 12:45 – yikes! I read somewhere that you should be at the boat 30 minutes ahead, so we booked it out of there. 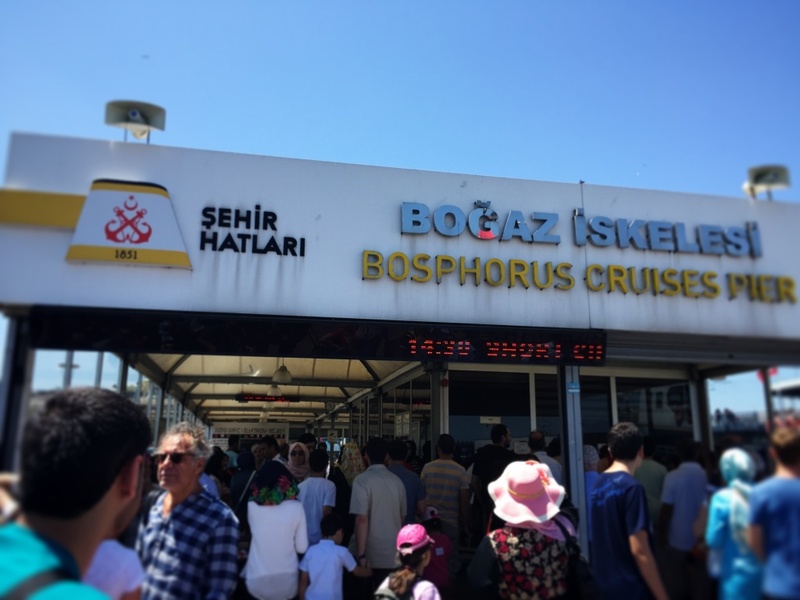 Several options for this cruise – I went with the classic ferry, a traditional Şehir Hatları ferryboat because larger boats = less motion sickness! Schedule for what I chose pictured below. 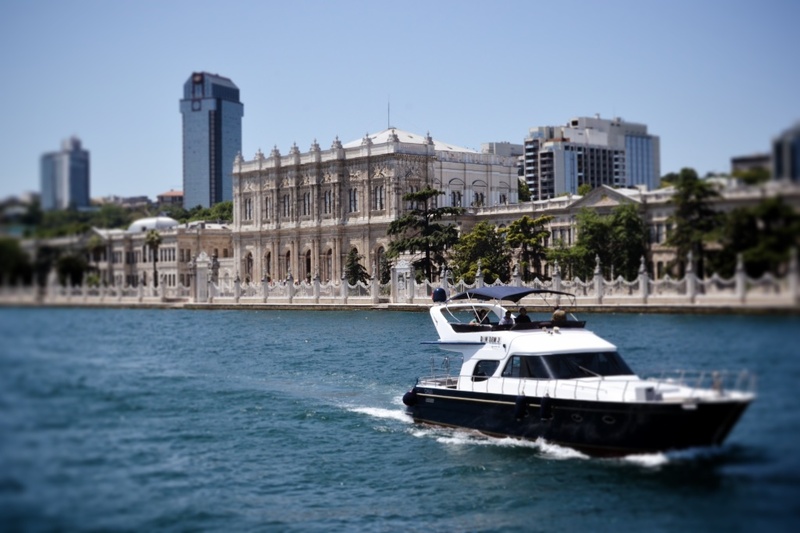 The journey started at the Eminönü ferryboat docks, traveled for 1.5 hours before stopping at Anadolu Kavağı – the most northern port on this cruise. Paid our fare (25 Lira, return) and crossed our fingers we had made the 1:30 sailing, aka the second and LAST sailing of the day. 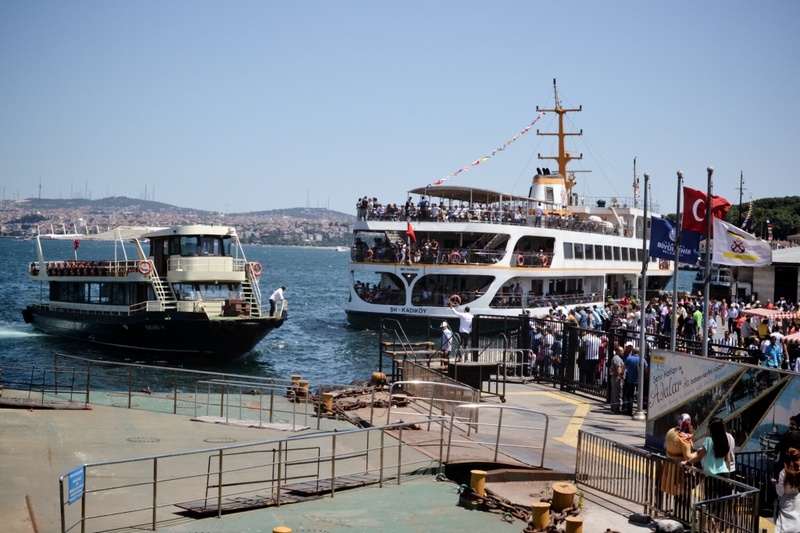 Derinda and I were wondering why there was a hold-up – wasn’t the ferry supposed to leave? So, she made her away ahead through the crowd and past the gates, waived me over, and said, “Let’s go”! We think that the crowd was waiting for a different ferry, but it was very confusing why they wouldn’t have moved out of the way. Well, we made it on the boat – the two very last ones! – Get a seat out outside, it’s hot and the wind feels so good against your skin. Plus you get better views and easier access to photos. I didn’t get a seat outside, but everyone stands to take their photos anyways it doesn’t really matter. – Stay on the same side of the boat going there, and coming back (eg. the right or left side of the boat) that way you see different sites. 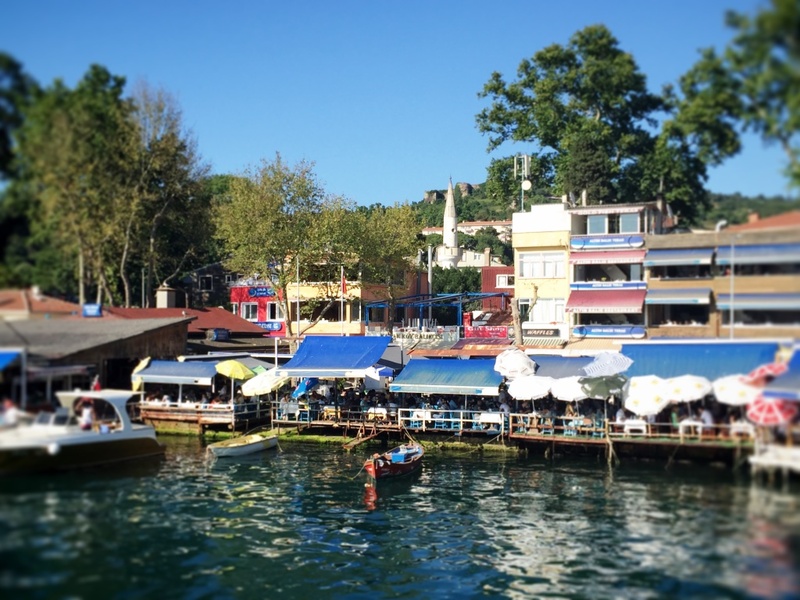 – There’s lots of food and water to purchase on the boat. Of course, it’s cheaper if you buy it beforehand. 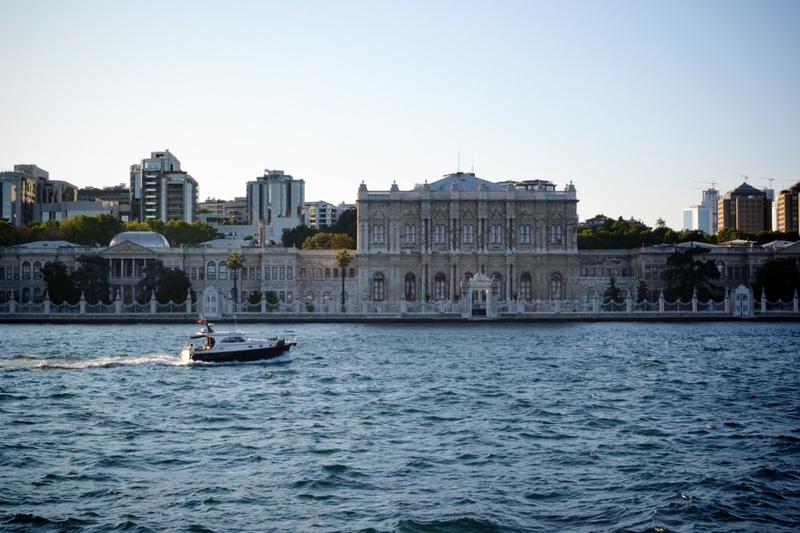 Dolmabahçe Palace – an opulent building of the Ottoman empire. 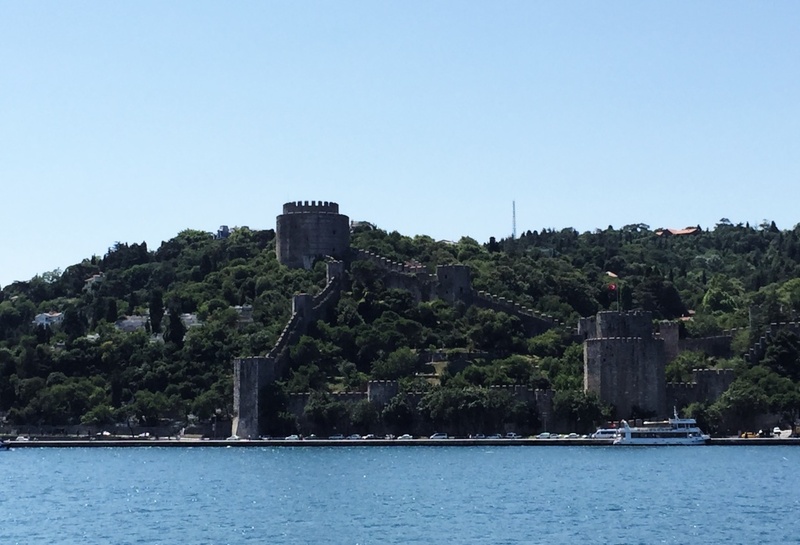 Rumeli Hisari fortress on the Bosphorus. 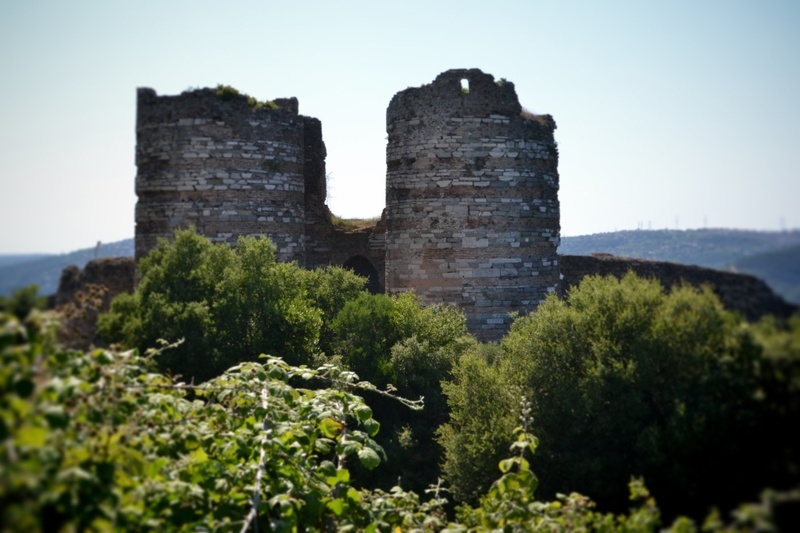 At the very last port, Anadolu Kavağı, – there is a long break to explore, grab food, or do what I did, trek to the top of the hill to see an old castle with fantastic views of the Bosphorus! I really lucked out because I didn’t save directions to get to the castle – I just started walking, and ended up at this sign which convinced me I was on the right path! 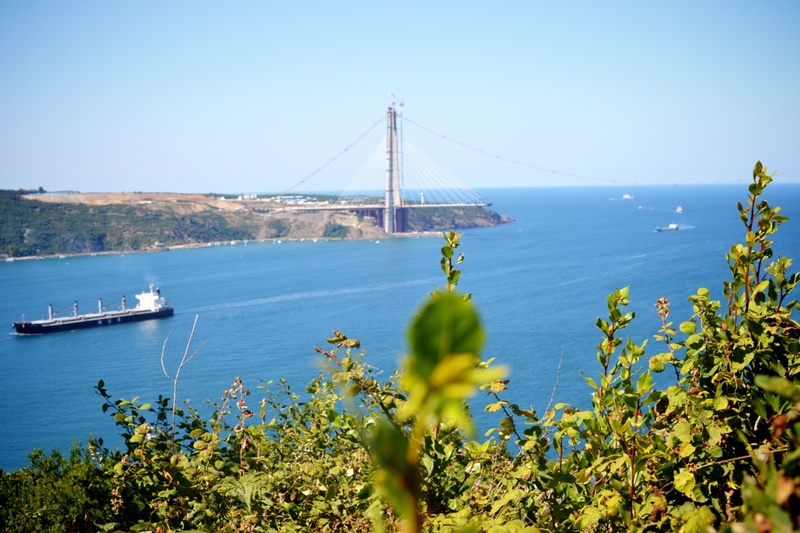 A new bridge to cross the Bosphorus under construction. After having accomplished this, I sat down at a waterfront restaurant and relaxed with a meal. I had an eggplant dish and fish stew. 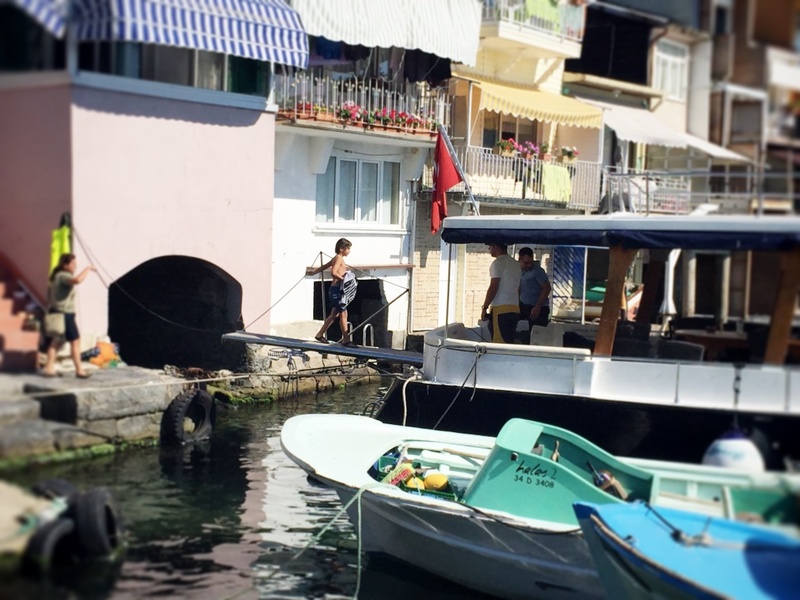 Another important thing to eat when you’re in Turkey – Balik Ekmek – Fish Bread! Derinda and I agreed to meet back and the boat and she got their early to save us seats on the deck. That was a perfect way to spend the day: easy and relaxing sight-seeing with the option to add some exercise! Back at the harbour, I caught this beautiful dusk glow descending on the city and then made my way to the hotel to meet my friend! But, not before stopping by Hafiz Mustafa again so I could purchase another selection of baklava. This time, I was persuaded to buy chocolate. I’m going to tell you now that the chocolate was AMAZING! I lead Derinda and I back to our hotel safely and opened my hotel door to be greeted by Alison! They got it back to her 24 hours later, just before we left for Cappadocia! The hotel staff was so great at helping us! In the meantime, thankfully, I always pack WAYYY too much so I was able to lend Alison clothes for the night (and for the rest of the trip ;). That aside, I felt like I had a good handle on the city so I took her on a walk up the street to Road Runner Travel! There she met the guys who had been helping us all this time to arrange our itinerary and this time it was Osman who went above and beyond by taking us to the pharmacy so Alison could get a tooth brush. I joked about lending her everything I owned down to the underwear, but the tooth brush is where we draw the line! With Osman with us, there was none of the harassment I experienced the previous night, so that was appreciated! As we were raising our glasses for a cheer – a bird flew over our heads and let it out right in front of Alison. Could the day get any worse for her!!?? Well, it appears ALL cultures, including Turkish, consider that “lucky” so we reassured her things could only get better! Osman helped us to take some photos in front of the Blue Mosque and then we retreated back to our hotel to prep for a packed City Highlights Tour the next day.